As a classroom teacher myself, I know the time limitations we have. I designed this tool to make evidence collection for Program Reviews a piece of cake and reduce the workload for all involved. I hope it saves you time, helps you identify areas of needed growth AND helps your school improve! 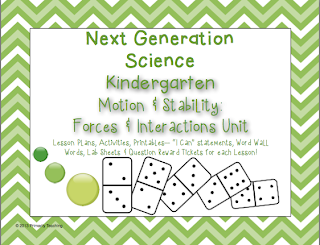 I am proud as can be of my new Next Generation Science unit for Kindergarten! I've already taught half the unit with my class and can't wait to finish after Fall Break. My little ones are so super-smart! And I know yours are, too. Download this awesome unit today! Get it at my TpT Store or my Teachers' Notebook shop! Buy it and I'll send you the SmartNotebook OR ActivInspire version for FREE! 2) Make your life EASIER! Included is everything (well, almost everything) you need for this unit. The teaching of science requires some materials, but I have chosen simple, everyday tools you most likely already have in your classroom. 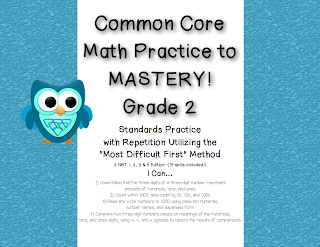 There are 8 lessons in this unit (some may stretch over multiple days), covering major standards under Energy, PLUS the cross-cutting concepts AND connections to ELA and Math Common Core. *A book about the Earth (which mentions/shows Earth’s surfaces) and a book about the Sun’s energy. I can identify different Earth surfaces. 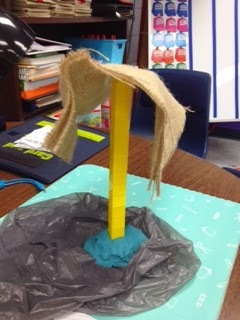 I can observe the effect of sunlight on different Earth surfaces. 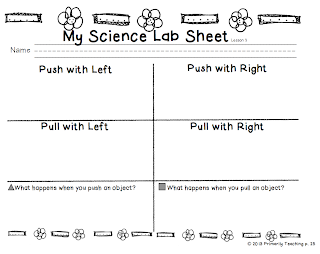 I can make observations to collect data that can be used to make comparisons. I can identify an observable pattern when something comes between the Earth's surface and the sun. Presentation of problem: People get hot sitting in the sun for long periods of time. 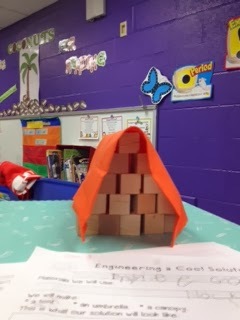 Your team has been hired to engineer a structure that will reduce the warming effect of sunlight on an area. 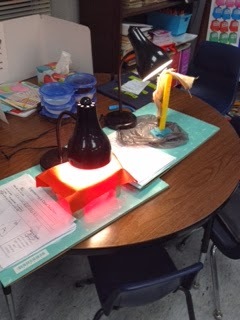 I can compare two different materials to see which objects reflects/absorbs more sunlight. I can make observations to collect data. I can use collected data to make comparisons. Use tools and materials provided to design and build a device that solves a specific problem or a solution to a specific problem. 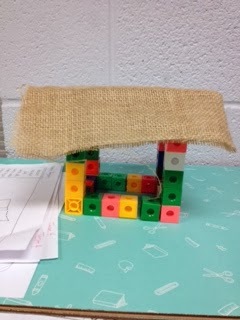 (K-PS3-2) (General) I can use tools and materials to design/engineer a device to solve a problem. 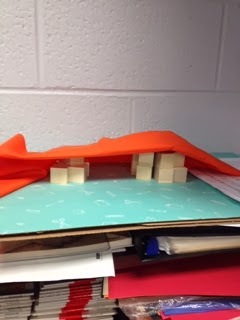 (Specific) I can engineer a structure that will reduce the warming effect of sunlight on an area. Also included is a K-friendly unit test with answer key. 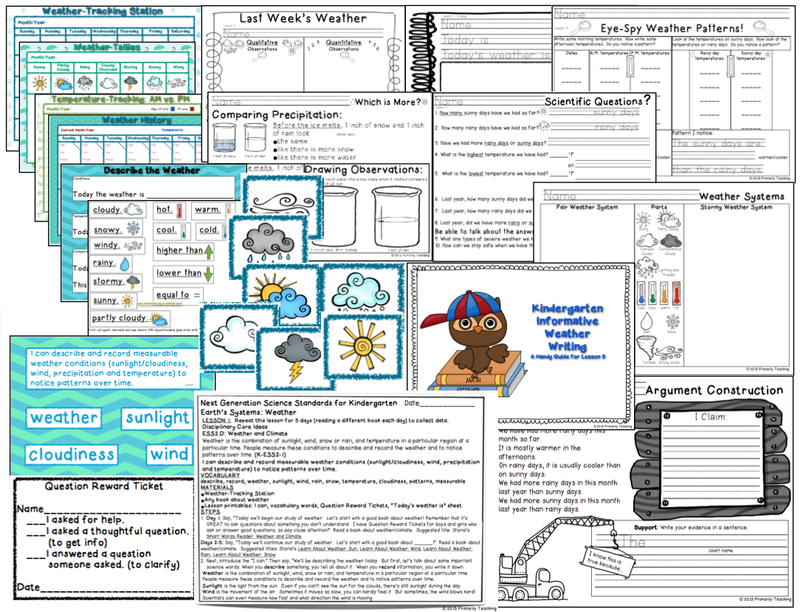 ADDED BONUS: Email me at primarilyteaching@gmail.com and I'll send you the SmartNotebook ready version OR the ActivInspire version FREE! Just mention your TpT username so I can verify you purchased the unit and I'll send you the whiteboard version of your choice for FREE! Thanks, SmileMakers for the Crayola Triangular Crayons! Not long ago, I received an email from SmileMakers, offering me a free product from their catalog to review on my Primarily Teaching blog. They have so many cool classroom products, it was hard to choose, but I selected the Class Pack of Crayola Triangular Crayons. Only a couple of days later, the Class Pack arrived and I have to say, these are the coolest crayons ever! 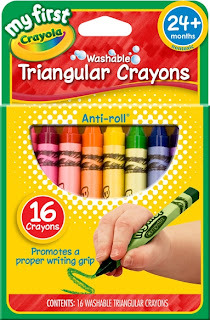 My favorite reason for using them with my kindergarten students is simply because they promote a correct writing grip. This is something that is so hard to teach if bad habits have already been established, but with the triangular shape, your fingers just naturally fit in the correct position. 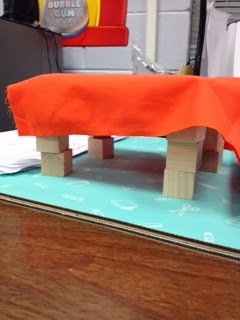 Another great feature is they won't roll off of the desk or table during class. 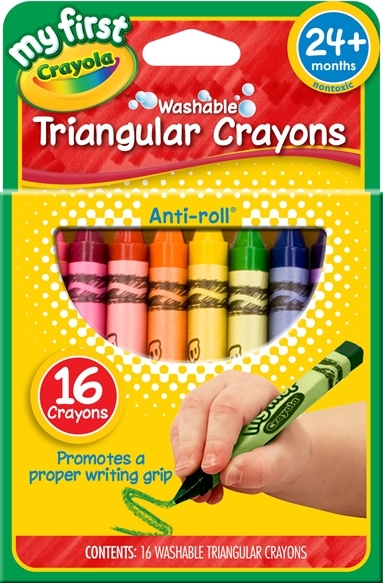 Regular-shaped crayons drop and break nearly every time we use them, but these chunky, triangular-shaped crayons stay-put. I'm sold! As long as I teach kindergarten, I'll be using these crayons. Thanks, SmileMakers, for letting me try them! We’re reaching out to teachers who happen to also be bloggers with a special offer. We’d love to send you a product of your choice from our site http://www.smilemakers.com/ to review on your blog. Almost any product is available to you - just let us know what you’d like! Once you receive the item and have a chance to take a look and put it to use, we’d love it if you’d send us the link to the review on your blog. Also, make sure to tell your fellow teacher/blog readers how they can benefit, too: SmileMakers offers Teacher Perks, added savings, just for teachers. Teachers will receive free shipping with any order of $49 or more or $4.99 flat rate shipping with any order of $48.99 or less. Teachers will also get special private sales & free gift offers! There are 9 lessons in this unit (some last several days), covering the major standards under the Earth’s Systems--Weather section PLUS the cross-cutting concepts AND connections to ELA and Math Common Core. •Lesson 8 requires two identical clear containers, a sharpie, water and a small amount of shave/crushed ice. Weather is the combination of sunlight, wind, snow or rain, and temperature in a particular region at a particular time. 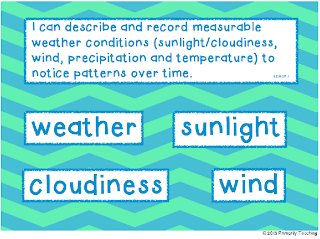 People measure these conditions to describe and record the weather and to notice patterns over time. 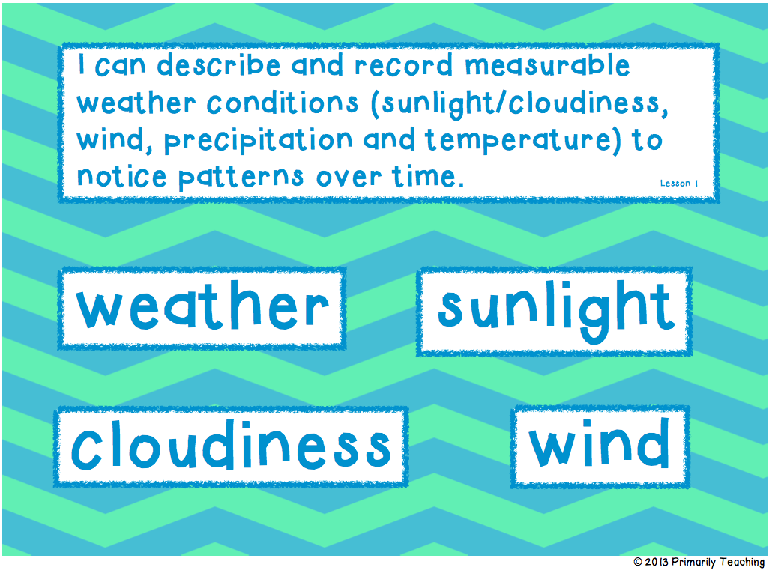 (K-ESS2-1) I can describe and record measurable weather conditions (sunlight/cloudiness, wind, precipitation and temperature) to notice patterns over time. 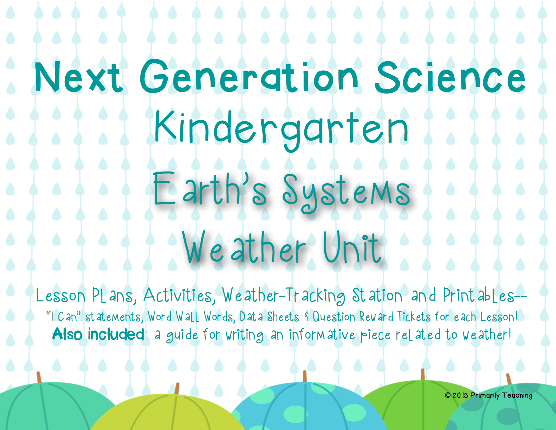 I can use and share qualitative and quantitative observations of local weather conditions. 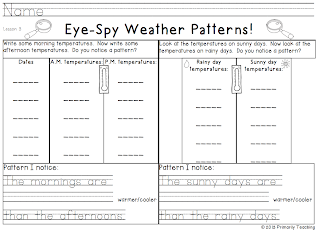 I can look for patterns and order when making observations of weather data collected over time. • Use observations (firsthand or from media) to describe patterns in the natural world in order to answer scientific questions. 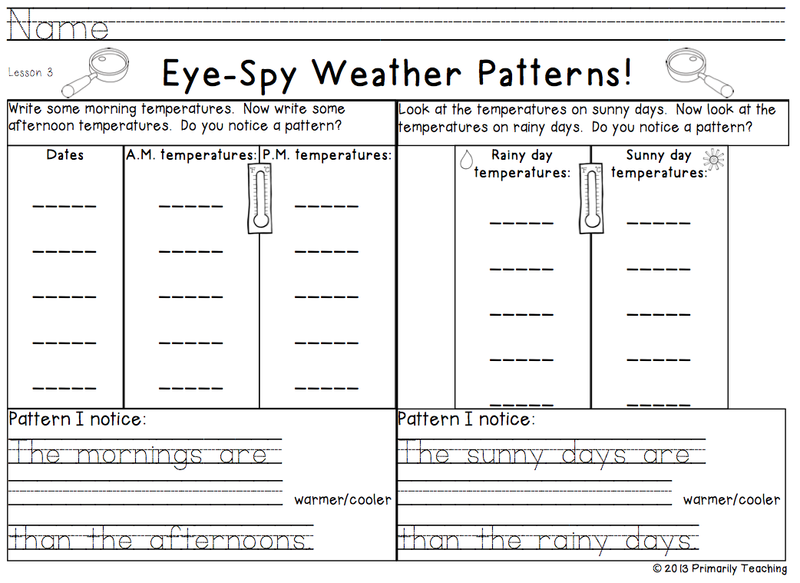 I can describe patterns about our weather observations to answer scientific questions. I can ask questions to obtain information about the purpose of weather forecasting to prepare for and respond to severe weather. I can identify patterns in our weather data that serve as evidence for an argument. 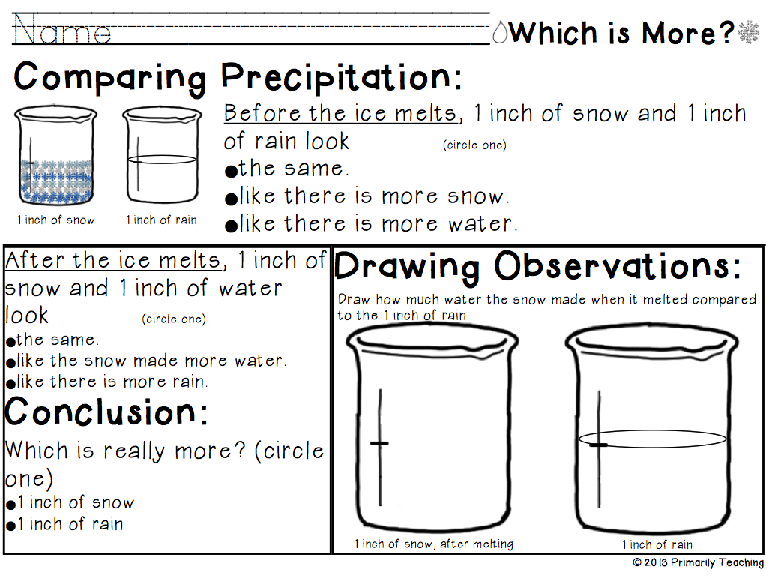 I can construct an argument about our weather observations with evidence to support my claim. 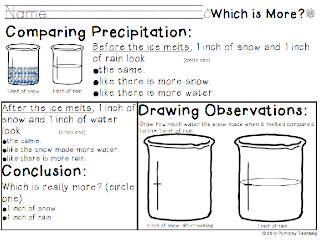 I can compare an inch of “rain” with an inch of “snow” to see which is more precipitation and describe the difference. I can work with a partner to research a weather topic and write an informative writing piece. Also included is a K-friendly unit test! As a free BONUS, I will send you either the SmartBoard-Ready file or the ActiveInspire version for whiteboard use! After your purchase, simply email me at primarilyteaching@gmail.com and send me your TpT OR Teachers' Notebook username. I'll verify you purchased the unit and I'll send you the interactive whiteboard version of your choice, which includes all "I can" statements, science word wall words and student activity sheets! 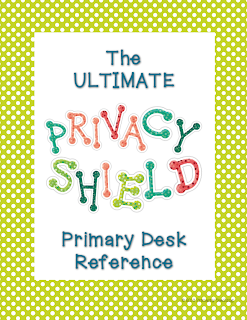 Download this awesome unit at my TpT Store, my Teachers' Notebook site or CLICK HERE to find out how to get it for FREE! Do you have awesome teaching ideas and resources you've created? Then you MUST try selling your creations on Teachers Pay Teachers. Click my link below and get started today as you are creating things for your own classroom! 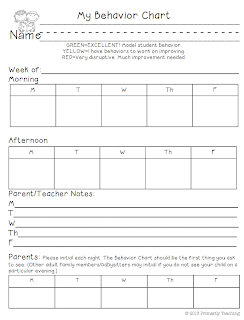 This is the behavior chart I use for first semester kindergarteners. They seem to need a "clean slate" after lunch for a while. I move to once-daily ratings after Christmas. I hope this is of some help to you, too! Next Generation Science, Here I Come! WooHoo! I've been working on this unit since school has been out, and I have to say, it's my best work ever. I LOVE science. And I also know my fellow K teachers are so swamped with teaching reading and numeracy, it's easy to put science on the back burner. 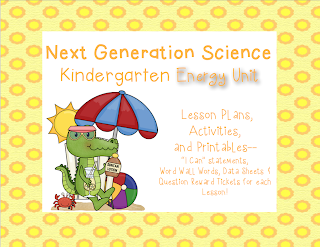 The new Next Generation Science Standards are out and I'm moving from 2nd grade back down to K, so I'm designing new units to go along with the new standards. 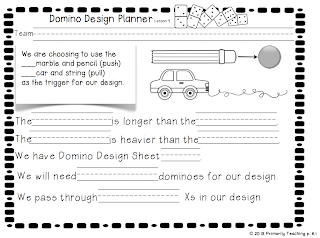 Lessons Plans (12 for this unit) are ready to print, hole punch and pop in your binder. 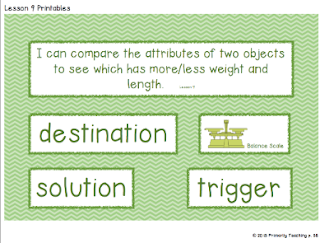 Lesson Printables like "I can" statements, word wall words, Lab Sheets and Question Reward Tickets are ready to go with each lesson. 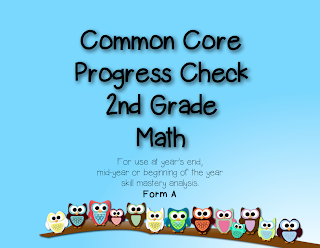 As a matter of fact, I think you'll like the Question Reward Ticket system so much, you'll no doubt use it across your curriculum--it's an ingenious way to track Common Core SL.K.3 (Ask and answer questions in order to seek help, get information, or clarify something that is not understood.) and it's a part of EVERY LESSON! So click on over to my Teachers Pay Teachers store or my Teachers' Notebook site and get your copy today! 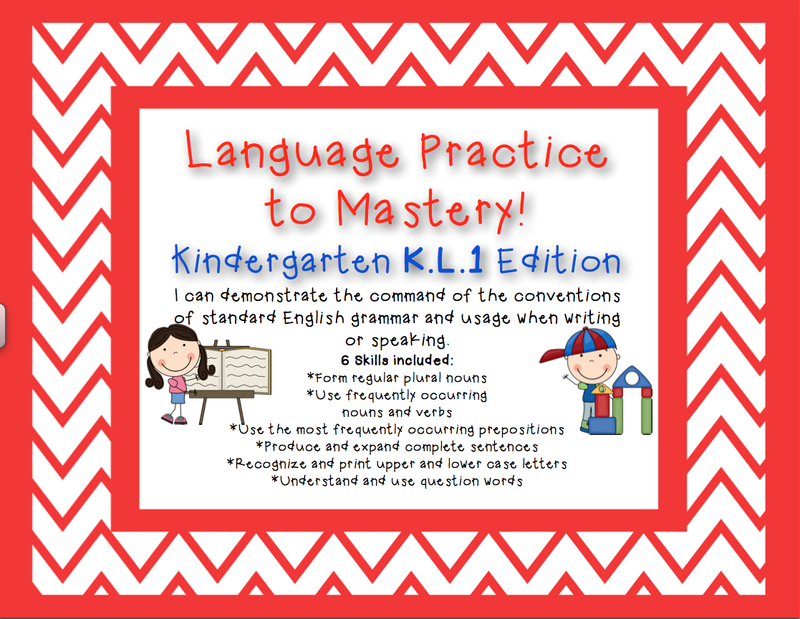 Kindergarten Common Core Language K.L.1 is Here! 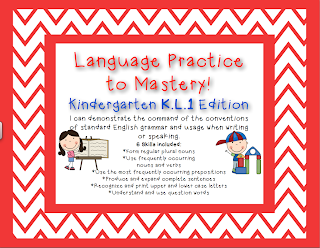 This unit includes everything you need to successfully cover the Common Core Language skills for kindergarten! 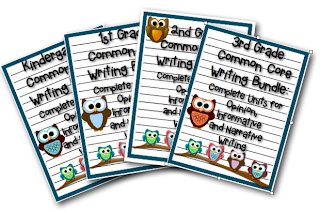 Download today at my TpT site, my Teachers' Notebook store or CLICK HERE to see how to get it for free! 2nd Grade Numbers & Operations in Base Ten--All Bundled Up! 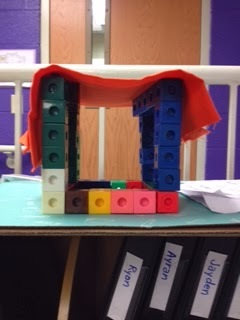 Numbers and Operations in Base Ten for 2nd grade is complete! 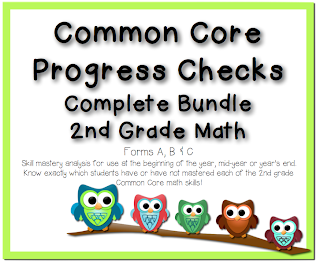 And I've bundled all four units into one set--47 "Most Difficult First" Lessons, 4 unit tests, Quick-Check Answer Sheets--everything you need to thoroughly cover ALL 2.NBT Common Core Standards! 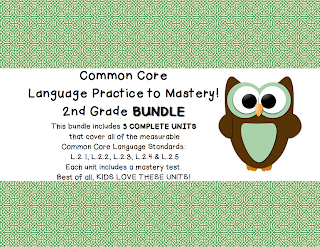 Download today at my TpT Store, my Teacher's Notebook Site or CLICK HERE to learn how to get any unbundled unit for FREE! P.S. 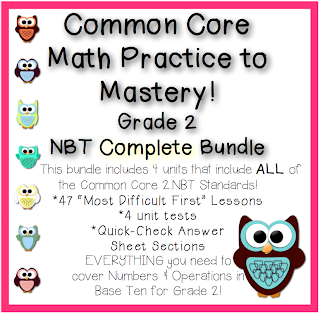 My unit for 2.NBT.1, 2, 3 & 4 is also now available! 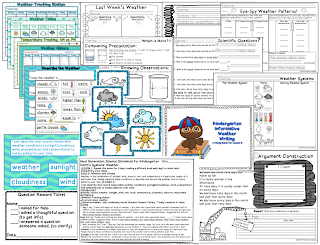 Download it today at my TpT Store, my Teacher's Notebook Site or CLICK HERE to learn how to get any unbundled unit (like this one) for FREE! 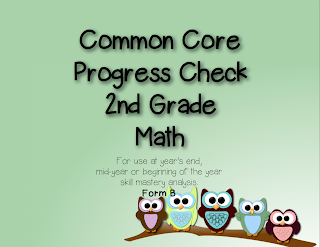 A Year's Worth of Common Core Progress Checks--All Bundled Up! 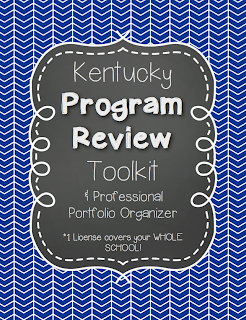 Download today at my TpT Store, my Teacher's Notebook Site or CLICK HERE to learn how to get any of my unbundled units for FREE!